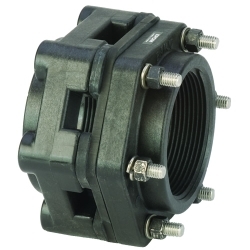 1" FNPT x 1" FNPT Polypropylene Bolted "Bottom Drain" Tank Flange | U.S. Plastic Corp. Allows 100% rinse free, no sediment build up! Excellent for avoiding herbicide cross contamination. 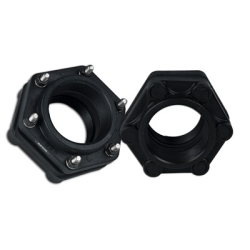 They feature a bolted design for superior strength. They will fit most cone bottom and chemical inductor tanks, 30 gallons and larger. Tank flanges are made of glass reinforced polypropylene with EPDM gaskets. Bolts are stainless steel and bolt head plugs are sealed ultrasonically. FKM gaskets and longer bolts are available by special order.